Ideal for encouraging blue flowers on Hydrangea plants. 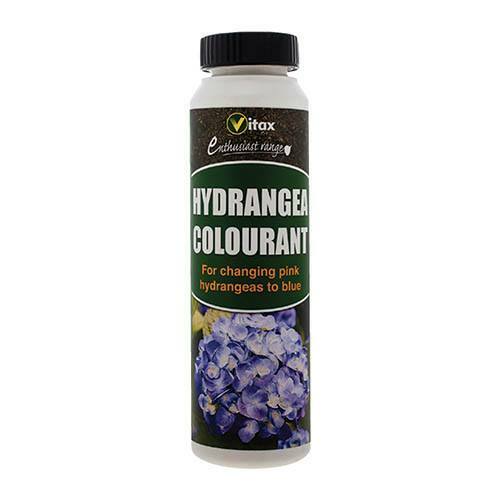 A soluble colourant, simply dilute in water or mix in soil or compost for effective results. Suitable for outdoor or pot grown hydrangeas. Contains Aluminium sulphate. Use weekly for best results. Supplied as a 250g bottle of soluble colourant. If you can only grow pink hydrangeas it's probably because your soil is too alkaline as this can determine flower colour. Used diluted in water or simply mixed in soil or compost this soluble colourant will encourage blue flowers on your prized plants. Suitable for outdoor or pot grown hydrangeas. Contains Aluminium sulphate. Use weekly for best results.